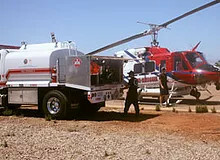 McLellan offers a line of fuel and lubricant vehicles for fleet refueling. 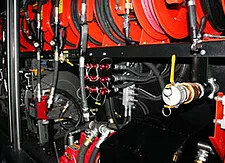 Developed in the rugged construction, agriculture, and commercial fleet refueling service industries, our trucks best serve our end users through quality construction and sensible design. Why choose a McLellan Lube Truck? 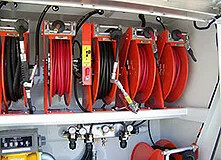 Prevent injury and strain from pulling hose with hydraulically powered McLellan reels. Insure proper vehicle maintenance with the right specifications customized by McLellan's engineers and designed to your needs.